As some of you may know, I am one of the Project Manager’s for the Royal school of Needlework’s studio. Which means I get the first scoop on new exhibitions that are happening within the company. 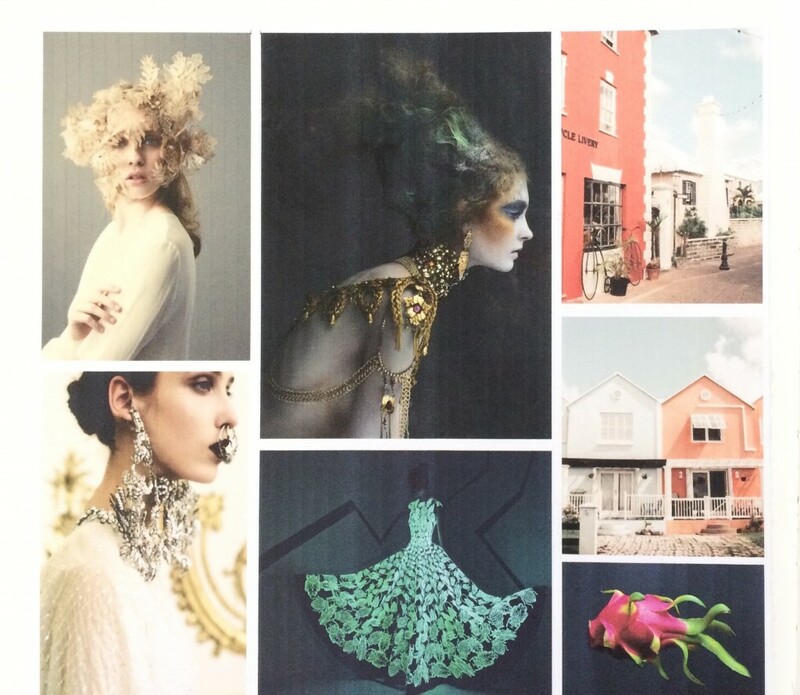 So when I heard about the RSN Degree’s Graduation Show, I arranged to have a sneaky peak and I was not disappointed. Here’s a little glimpse into what you can expect to see if you are able to visit. 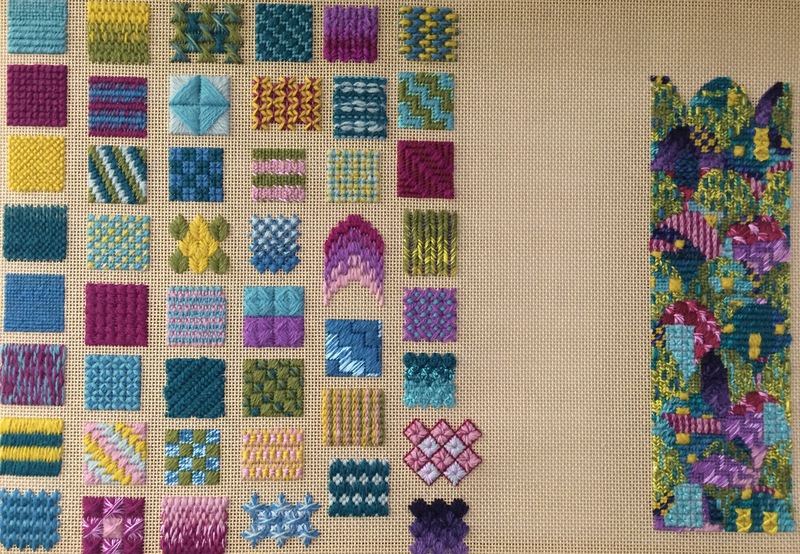 One of the first techniques new students learn is Jacobean Crewel Embroidery. Jacobean uses a broad range of stitches to create texture and depth to the piece. Stitches such as long and short, trellis, French knots and chain stitch are all used to fill and outline the design. A restricted colour palette is often used, creating a bold and intense design. Here are two examples of Canvas stitches. This technique is worked on a canvas base. Stitches are created by counting the threads of the canvas to create a variety of patterns. 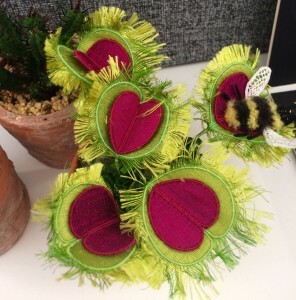 There are diagonal, horizontal and vertical stitches all of which can be used to produce a textured and 3D design. 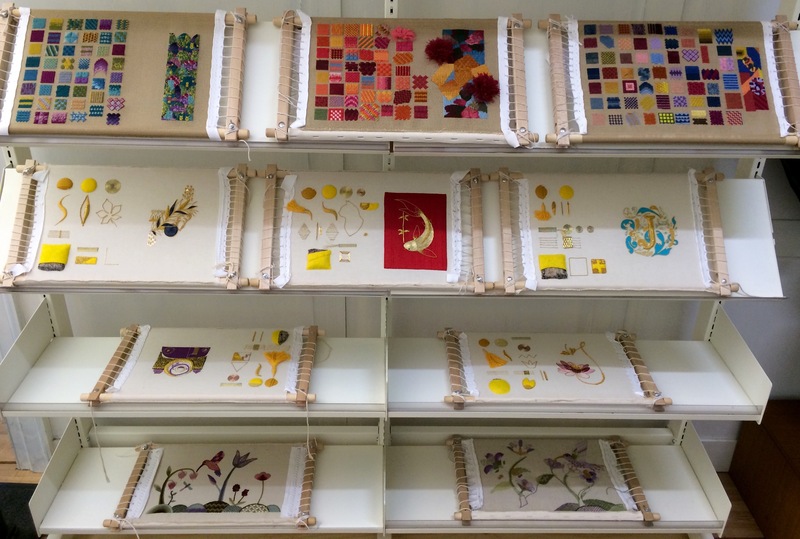 Below is a further selection of Jacobean, Canvas stitches and Goldwork sampling from the first years. 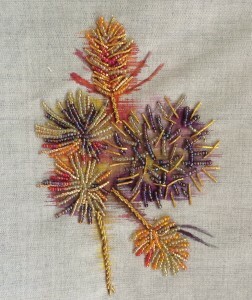 Lizzie’s contemporary use of colour highlights how a traditional technique such as Goldwork can be given a modern interpretation. The teal blue chip work creates a striking yet balanced design. 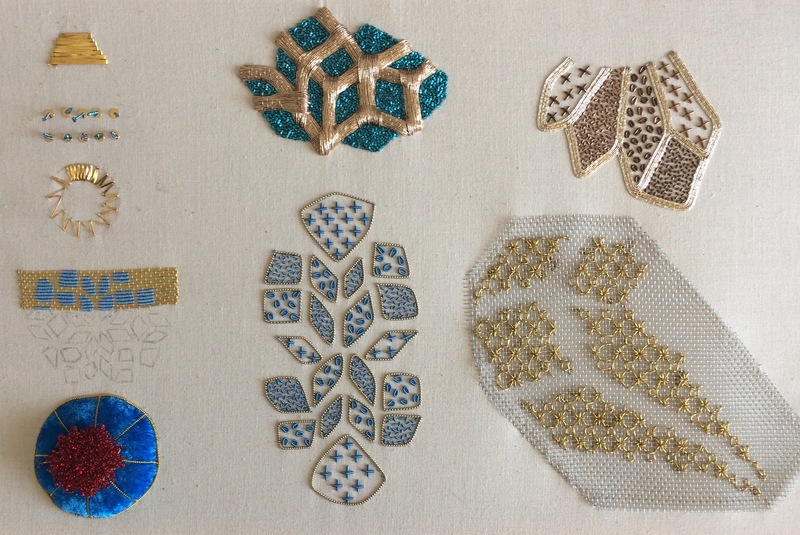 I love how Lizzie has worked gold over a mesh, creating a style and patterns similar to which you would find in Blackwork. 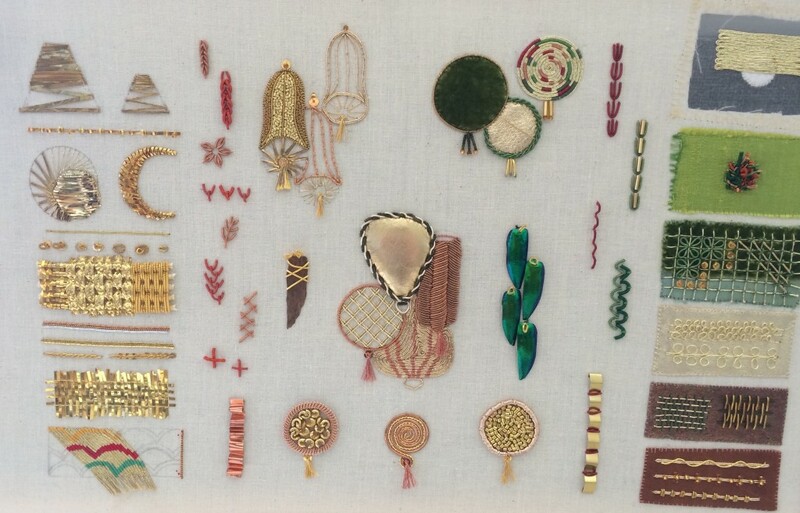 Below is a selection of goldwork samples. I love the way Alex has taken a traditional technique and found creative uses for it. Plate has been couched over string padding and coloured Purl has been used to create traditional stitches such as chain, fly and feather stitch. Or Nue has been worked in circles and used to create a scalloped effect. To the left you can see a selection of Alex’s stumpwork samples. These have been worked with wired edges so that they hold their shape when cut out. I love the combination of bright colours, which captures a Venus Fly Trap perfectly. Here, on the right you can see the finished piece, I love the addition of the stumpwork bee which has been worked in Turkey Rug stitch with little white needlelace wings. 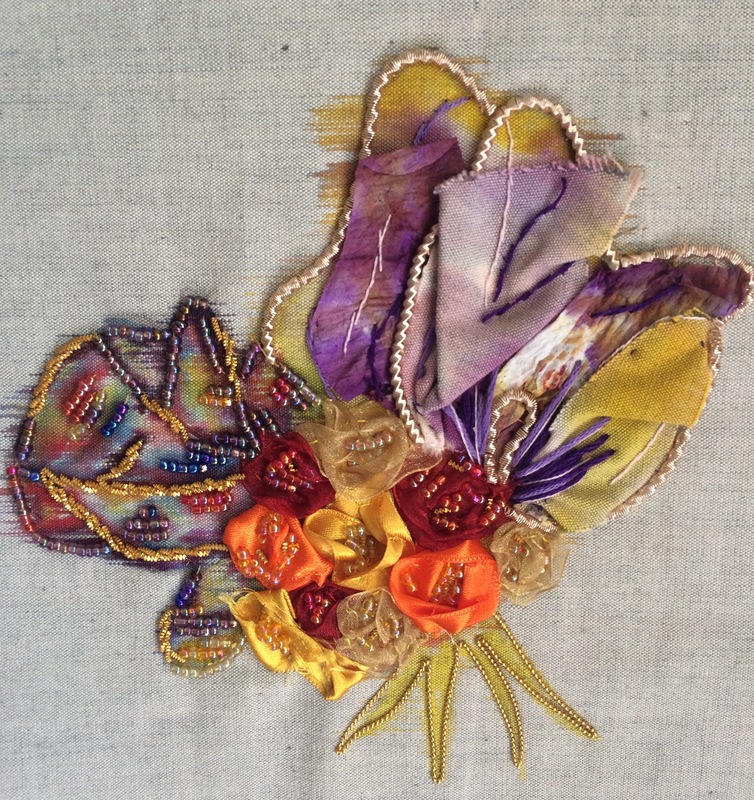 A love of floral and vintage runs through Millie’s work and she has taken inspiration from a ‘patchwork pocket’ from the RSN archive collection. She has an interest in floral English patterns and antique fabrics whichhas added authenticity and charm to her work. 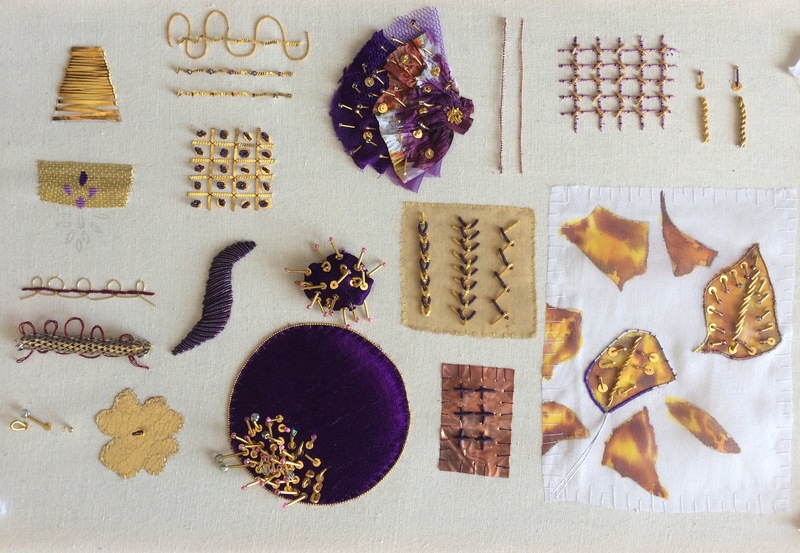 Below you can see a selection of her goldwork samples. 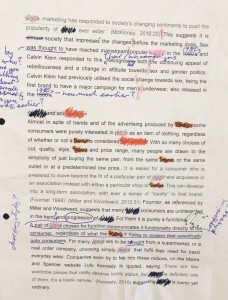 I love the additional use of purple which gives a luxurious quality to her work. 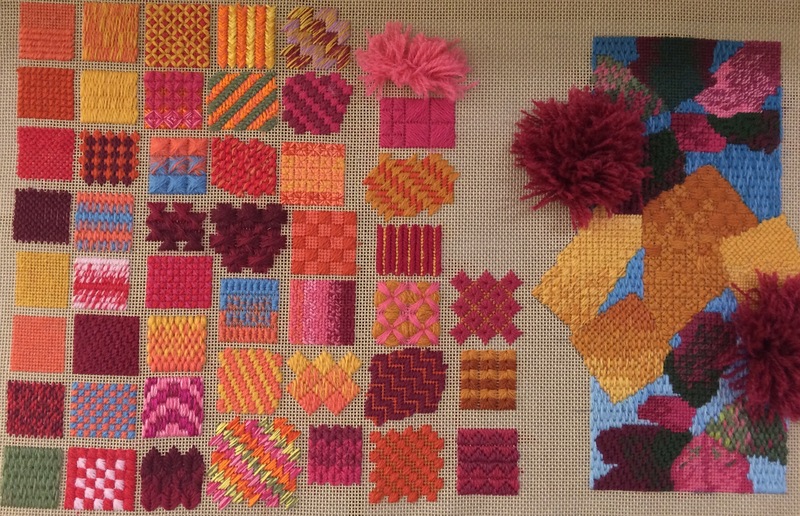 Here are two of Millie’s samples in which she has included beads and fabric manipulation, along with a painted background. This has created a rich texture that captures the floral theme. Livia’s extensive research into design and stitch sampling is well documented. The needlelace parrot has been well worked and Livia has incorporated beads into the wing to add some sparkle. Esther’s inspiration came from an unusual source. 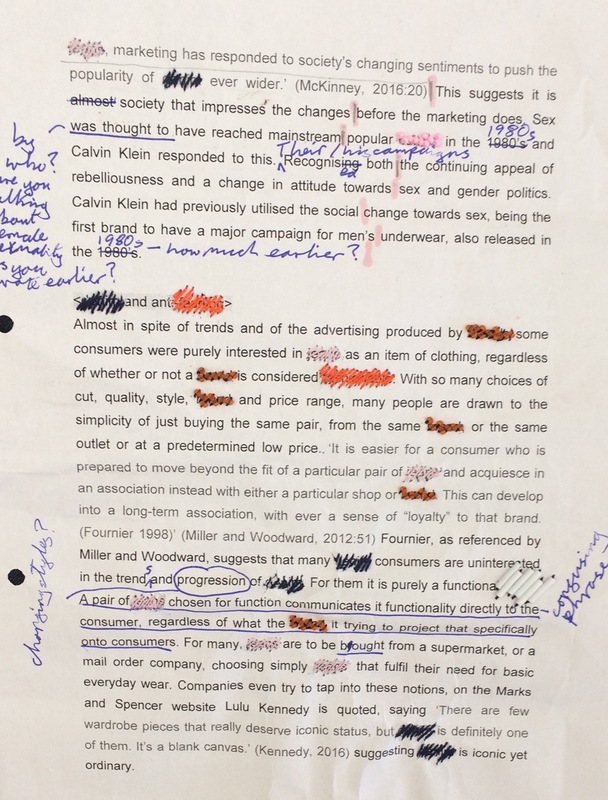 She decided to recreate her dissertation in stitch. 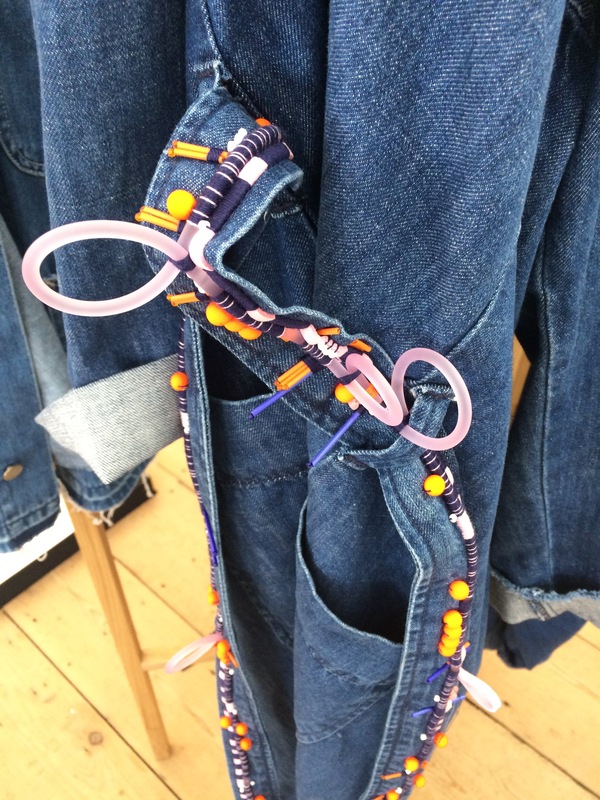 Using a combination of satin stitch for the words and beads for the punctuation, below is Esther’s work on denim. With the basis of her work being influenced by Bermuda, Elena based her design ideas on the night blooming, Cereus flower. Her colours have been taken from that of the flower. Below you can see a selection of images that inspired her. 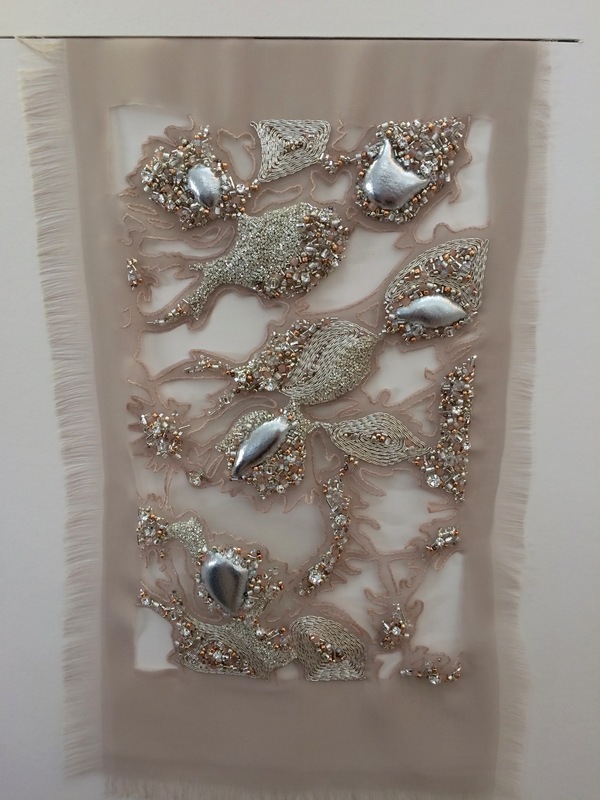 The delicate chiffon supports a heavy blend of goldwork and beading, while the raw edges have been painstakingly stitched and then cut away. 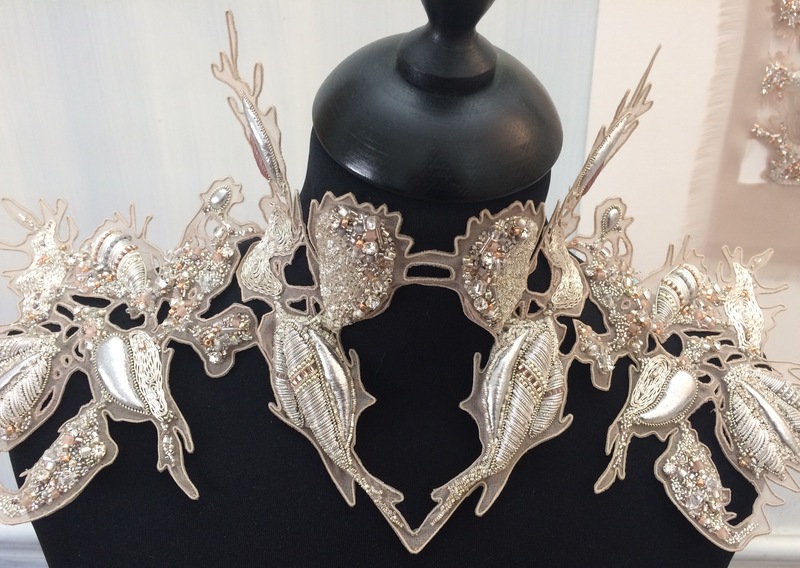 Padded kid leather in silver adds a further dimension while the encrusting of crystals and beads create the sparkle. 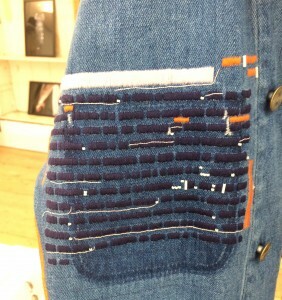 Even though this sample is heavily stitched, Elena has still retained a delicate quality to her work. Below are some of Elena’s final pieces. 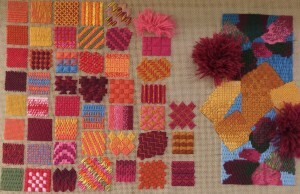 She has taken many elements from the sample but this time has included cutwork in smooth purl and bright check. This time the edges have been stitched over wire, which helps the pieces to stand free without any additional support. 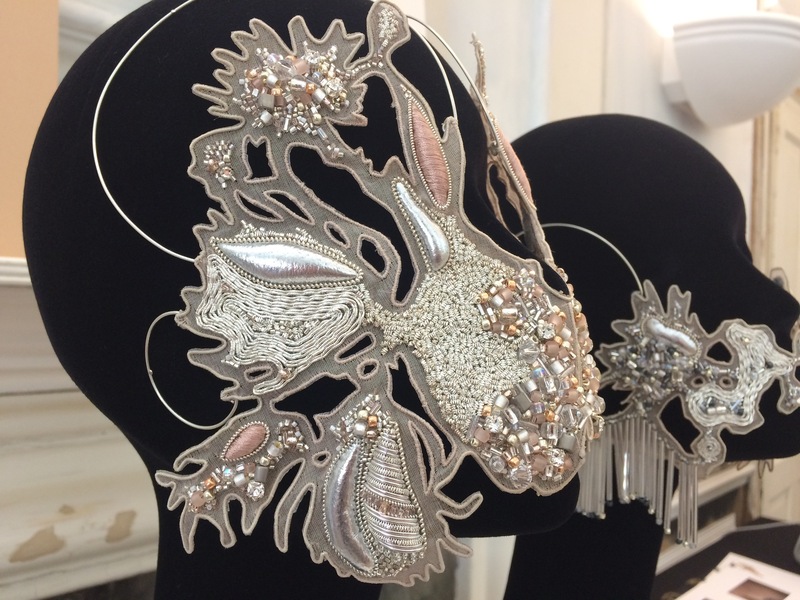 The edging alone took Elena around 100 hours to complete on the neck piece. Elena has created a beautiful body of work that manages to show the delicacy but also robustness that hand embroidery can encapsulate. The show is running from the 8th-17th June 2017 with two viewing slots a day. The first at 10am and the afternoon slot at 2pm. Click here for further information and to book your slot. 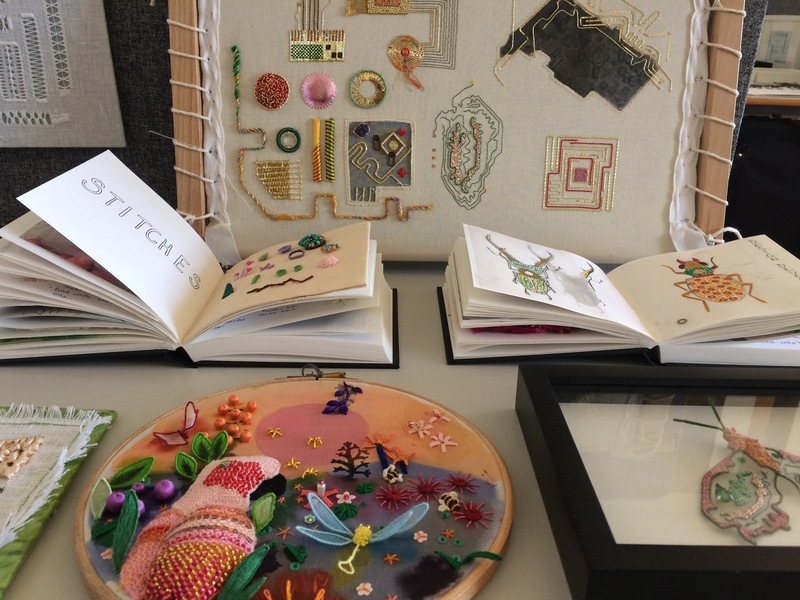 If you are interested in studying embroidery on the RSN Degree course then all the information can be found here. I do hope you have enjoyed this post and if you get to see the show, you will continue to be inspired. 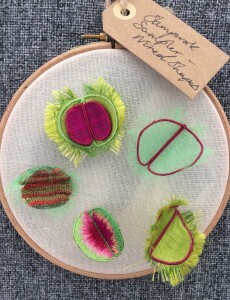 I think it is safe to say that the future of embroidery is looking bright. I would love to hear your thoughts and comments below.